Sergeant T.H. Anderson was a member of our men’s Bible class at Howgill Street, Whitehaven, and took an active interest in the welfare of the class. He was a young man of considerable promise. Before joining the Army he was associated with his father in business as a builder and contractor. He soon gained promotion in the ranks, and was most popular with the men and officers in his company. He was a brave and daring soldier. He was killed in action in France. A memorial service was held in our chapel, conducted by Rev. E. Campbell, his character and work in our school being eulogised. Thomas was L/Sergeant 13525 in the Border Regiment, 8th Battalion. 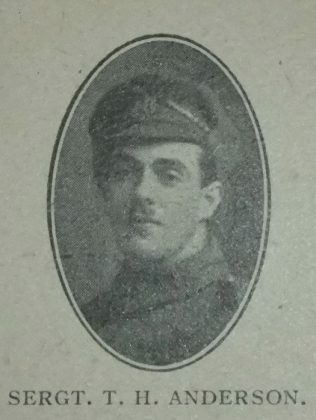 He was killed in action on 27 April 1916.